Your hardwood floors deserve better. They should have the same shine after years of use and be clean as close to 24/7 as possible. But, for many, their floors are far from well-taken care of for a few reasons. Whether it’s the time commitment that it takes, a lack of knowledge on how, or simply not wanting to put in the effort, you can solve all these problems with a steam mop. We’ll tell you what a steam mop is, why they’re great, and how to clean hardwood floors with a steam mop. 1 What is a Steam Mop? A steam-mop is exactly what you would expect it to be: a mop that uses steam to clean up your floors far better than any other mop you have ever used before. If you’ve got a regular mop, you know how they need chemicals and cleaning agents to achieve a remarkable clean. However, a mop uses the power of water vapor to clean, shine, and disinfect in order to give you a perfect floor. It’s way safer, far easier to use, and an overall better choice for cleaning a hardwood floor. Most steam mops are going to look generally the same. You will see a mop head that is covered with cloth on its face. The handle will be about four feet tall with a tank on it to hold the water that will be turned to steam. You’ll also find a few buttons on the handle and a cord to plug into the wall for providing the power to heat up your steam. In this one compact package, you’ve got everything you need for a clean floor. Using steam versus more traditional hardwood floor cleaning methods is awesome for several reasons. First, you aren’t going to see any residue or staining from detergents when you use a steam mop – and for a very simple reason. You aren’t using any such harmful substances. You’ll also have no streaking effects since the quality of the water vapor actually prevents streaks. Last, you won’t have to wait for your floor to be dry past a few minutes. It can be difficult to keep your floor clean using a traditional mop because you’re bound to get something stuck to the floor even after you think it’s dry. With a properly used, none of these things are worries for you. Just a perfect clean. But this is not to say that all is peachy when it comes to how to clean hardwood floors with a steam-mop. You will have to pay very close attention to the temperature of the steam coming out of your mop due to the fragile nature of a hardwood floor. If the steam is too hot, it can cause your floor’s stain to become dull or remove it altogether. Steam that’s too hot can also get your floor to buckle at its seams. These things always are avoided by properly using an appropriate mop for your flooring. There are two major types of steaming mops: stick types and canister types. We recommend canister steam cleaners because they can be more easily pulled away from the floor. This will help you to keep the cloth dry so you can keep getting a streak-free clean. However, you will also need to be careful that you don’t let your mop sit for too long without using any steam, you’ll end up with condensed water in your hoses and dripping on your floor. So, either way, user error is a factor – but figuring out which option is better for you is still easy depending on how you want to use your mop. Beyond the type of mop you get, you will want to be thinking about the available features you can get in your steam mop. Most of all, you should be looking for a mop that lets you change the cloth out quickly and easily. You’ll be needing to change out your cloth often with steam cleaning (because you’ll get a lot of dirt out of that floor!) so you can keep a clean mop against your floor. Last – but not least – steam mops will have a triggering system to let you turn your steam stream on and off and an easy to open top to fill your tank. Those are the absolutely necessary features that you are going to want in your new mop. To actually use your steam mop, you’ll follow some pretty simple – but very important – steps. The absolute best way to use your steam mop is by lifting it up and away from the floor while you blast the steam. This will guarantee that you don’t screw up your floors by getting them too hot. Use short bursts that let you get steam onto the floor but also don’t leave you with streaks or trails of moisture that are too big. You will want to see a small trail of wetness that looks similar to wiping with a well-wrung washcloth. Once the cloth becomes too dry, you’ll notice because it will stop being effective. Getting the right amount of steam takes a little practice but here’s our pro tip: Try to err on the side of too dry. You won’t do any damage to your floor by being too dry but you can if you get it too wet. You may find some particularly troublesome spots on your floor. Don’t sit and blast steam at it! Instead, try to scrub it with your cloth. If you need more steam, lift the mop’s head away from the ground as you normally would and give it some more steam. Avoid too much moisture! Clean is the name of the game here, right? Well, going after a hardwood floor with a steam mop is the cleanest that your hardwood floor can be. 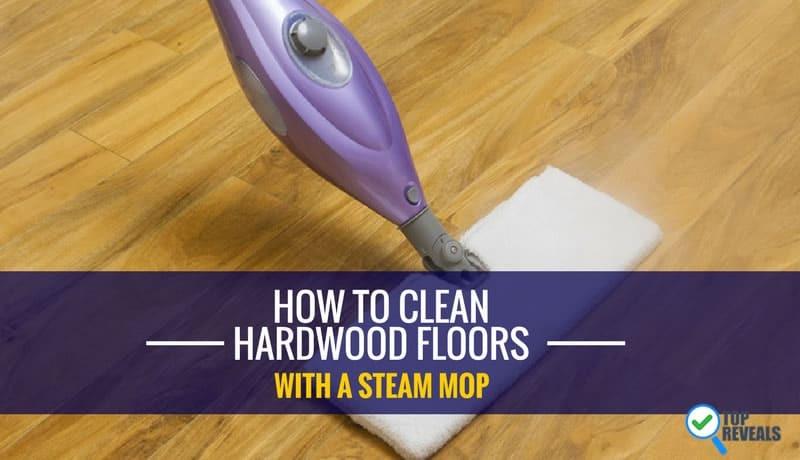 In reading this article, you’ve found out what a steaming mop is, what to look for in a good one, and how to clean hardwood floors with a steam mop. You’re all set and ready to go to get your floors as clean and shiny as the day that you first saw them.